We have information you must know before you buy the Sierra 1500. The all-new 2019 Sierra 1500 continues arriving at dealers. Supplies still have room to grow over the next few months. You might find discounts at high-volume dealers, but nothing substantial yet. Crew Cab models are easiest to find and most likely to be discounted. On the other hand, locating a Regular Cab may take some patience. The line-topping Denali isn't usually discounted at all by dealers. The 2018 Sierra 1500 will remain on sale for at least another month. It continues for 2019 with fewer trim choices as the Sierra 1500 Limited (covered in a separate entry). Current factory offers will remain in effect until April 30, 2019 and are available nationally unless otherwise noted. GMC sometimes enhances incentives for Memorial Day weekend end. GMC now offers 18% off the MSRP of 2018 Sierra models in stock. If you finance through GM Financial, the discount increases to 20%. That works out to a savings of $10,039 on the SLT 4x4 Crew, for example. GMC is also offering standalone cash rebates this month, but you'll save much more by taking the MSRP discount. You can now lease a 2019 Sierra Denali from $499 for 39 months (10,000 miles year) with $6,759 due at signing. The effective monthly cost works out to $672, a good value for a luxury truck of this price. Lease specials on the 2018 Sierra have ended. Instead of the other offers on a 2018 Sierra, you can get 0% financing for 72 months, plus $1,250 bonus cash. Offers this good are rare on the Sierra. There are no promotional rates yet on the 2019 Sierra. As even work-spec trucks begin to offer more luxurious amenities, one might think that the position of the GMC Sierra – essentially a Chevy Silverado in nicer duds – might be becoming superfluous. But don't think that GM is euthanizing their golden goose just yet. The 2019 GMC Sierra 1500 is all new, and the Sierra continues to stand firmly apart from it's also all-new cheaper twin. 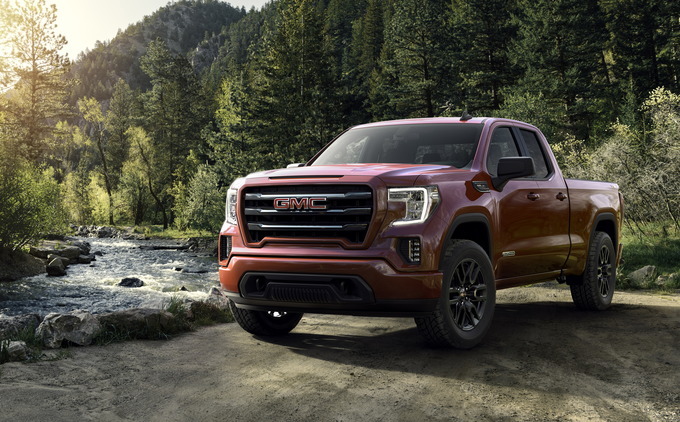 The range-topping Denali trim returns to define the GMC experience, and buyers will also find new and exclusive features that convincingly bolster the Sierra's claim of being the leader of the premium truck segment. The Sierra is all new for 2019. The previous generation Sierra saw 87 percent of buyers opting for the SLT or Denali trims on Crew Cab models, so for 2019 GMC simply has made SLT the base model and kept the popular Denali as the uplevel option. Crew Cab is now the only cab style, and the shorter five-foot-seven-inch box is the lone bed size. For anyone who's complained that the seemingly endless amount of potential full-size truck configurations is too confusing, the single-configuration Sierra is a breath of fresh air. One choice buyers do have is between two-wheel drive and four-wheel drive. Two-wheel-drive models are only available with the tried-and-true 5.3-liter V8 engine, while four-wheel-drive buyers have the option of getting the also-proven 6.2-liter V8. For 2019, both of these engines feature stop/start technology and Dynamic Fuel Management, a system which lets the engines operate on anywhere from the full eight to just a single cylinder in an effort to optimize power and performance. The 5.3-liter engine puts out 355 horsepower and 383 pound-feet of torque, which is the same as last year's model, and is paired to an eight-speed automatic transmission. The 6.3-liter's 420 hp and 460 lb-ft of torque is also unchanged, and is sent to the wheels via a new 10-speed automatic transmission. The big powertrain news, though, is the eventual availability of a 3.0-liter inline-six turbodiesel, which will be paired with the 10-speed automatic. As of this writing there's few other details available on this oil-burner, so we'll update this page as soon as we learn more about GMC's first-ever light-duty diesel. With the redesign, GMC has introduced a number of notable available features to the Sierra. These include a color head-up display, a surround-view camera, a rear camera mirror, and a full suite of active safety features (well, almost – there's still no adaptive cruise control). Perhaps most appreciated is the new, industry-exclusive six-way tailgate. With it's six distinct positions and functions, the new tailgate can function as a step, seat, or work bench. This nifty piece is standard on all Sierras. The box that the tailgate opens up to is also redesigned, offering 50 percent more strength than the current model. If that's still too wimpy, a carbon-fiber bed will be available later in the year. Yes, that's right, that haloed stuff of supercar status will now be found in the inner walls of a pickup bed. GM claims that the carbon fiber saves over 60 pounds when compared to the standard steel box and that it'll be the most dent-, scratch-, and corrosion-resistant bed in the class. All trucks also come with the ProGrade Trailering System. 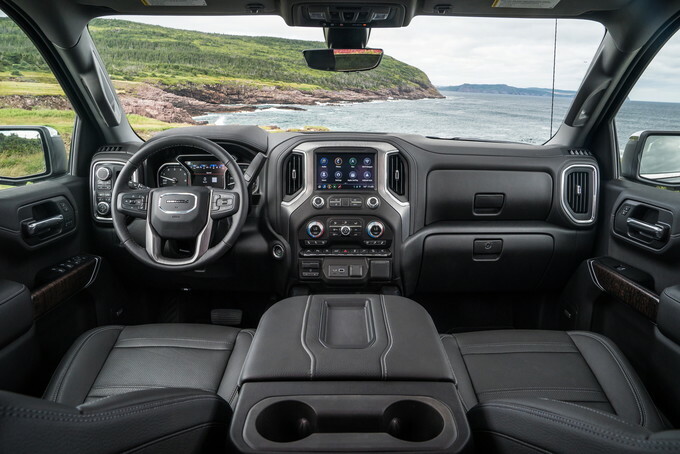 It includes an onboard app that puts a pre-trailering checklist, maintenance reminders, electrical diagnostics, and other helpful functions right on the eight-inch infotainment screen. Many of these features are also available on the MyGMC smartphone app. Available Packages include the Assist Step and Tonneau Cover Package ($1,295), Cargo Convenience Package ($495), and Tralier Camera Package ($250). 4WD is an additional $3,300, while the 6.2-liter V8 adds another $2,495. Eleven exterior and two interior colors are available. Starting at $48,195 (all prices include the $1,495 destination charge), the Sierra SLT certainly isn't your grandfather's workhorse farm truck. The extensive list of standard features includes a trailer hitch and wiring, the 5.3-liter V8 and eight-speed automatic, an automatic locking differential, 18-inch wheels, chrome bumpers, LED lights, heated and power-adjustable mirrors with driver's side auto-dimming, cargo-bed lighting, and the new multi-function tailgate. Inside, there's an eight-inch color touchscreen (with HD and SiriusXM radio, Android Auto and Apple CarPlay, and Bluetooth capabilities), six speakers, a 40/20/40-split front bench seat with 10-way power adjustments for driver and passenger, heated front seats and steering wheel, leather upholstery, built-in WiFi, a 4.2-inch driver information cluster, remote start, keyless entry, dual-zone climate control, and two each of 120-volt and 12-volt outlets. Packages abound with the SLT. Starting things off is the $1,070 SLT Preferred Package that includes navigation, a Bose seven-speaker audio system, and wireless charging. An SLT Convenience Package costs $1,460 and includes includes heated and ventilated front bucket seats, a power sliding rear window, heated rear seats, and two USB ports. The SLT Premium Package runs for $3,060 and includes the contents of the Convenience Package as well as chrome assist steps and 20-inch wheels. The most expensive and comprehensive package is the $5,875 Premium Plus Package, which includes all the aforementioned features along with a spray-on bedliner, as well as the active-safety features of Driver Alert Packages I and II. The first includes front and rear park assist, lane-change alert, blind-spot monitoring, and rear cross-traffic alert; while Driver Alert Package II includes forward collision warning, lane keeping assist, lane departure warning, low speed automatic emergency braking, pedestrian detection, auto-dimming headlights, and a following distance indicator. If you want only the safety equipment, GMC sells the Driver Alert Package I for $940 and II for $745. A Max Trailering Package costs $850 and includes a 3.42 rear axle, 220-amp alternator, upgraded suspension, a trailer brake controller, and additional trailering equipment. In it's usual place at the top of the Sierra's lineup is the $56,195 Denali. Additional standard features over the SLT include genuine wood trim, perforated leather seating, dual exhaust, navigation, Bose audio, heated and ventilated power-adjustable front bucket seats, heated rear seats, an eight-inch driver information center, adaptive ride control, and the contents of Driver Alert Package I. There's also some additional chrome, Denali badging, a unique Denali grille, and 20-inch chrome wheels. As with the SLT, buyers can opt for the Cargo Convenience Package, Trailer Camera Package, and Driver Alert Package II. Exclusive to the Denail is the $1,625 Technology Package, which includes the rear camera mirror, surround-view camera system, and head-up display. Oddly enough, the Max Trailering Package isn't available. Not yet available but due out later in the model year is the off-road focused AT4 trim. It comes standard with the 5.3 V8, but will be available with either the 6.2 V8 or 3.0-liter six-cylinder diesel. Standard features include a factory two-inch lift, off-road shock absorbers, 18-inch wheels with all-terrain tires, hill descent control, a selectable traction system, the multi-function tailgate, black chrome finish, body-color grille and bumpers, exclusive interior trim, and red recovery hooks. As of this writing pricing hasn't been announced, but expect the AT4 to have a sticker price that's closer to the Denali than the SLT. As enticing as the Denali's snob appeal is, save money by getting the 2019 GMC Sierra 1500 SLT and adding the equipment package(s) that most strikes your fancy. Even if you opt for the priciest $5,875 Premium Plus Package, the total out-the-door cost is "only" $54,070 – over two grand cheaper than the Denali. 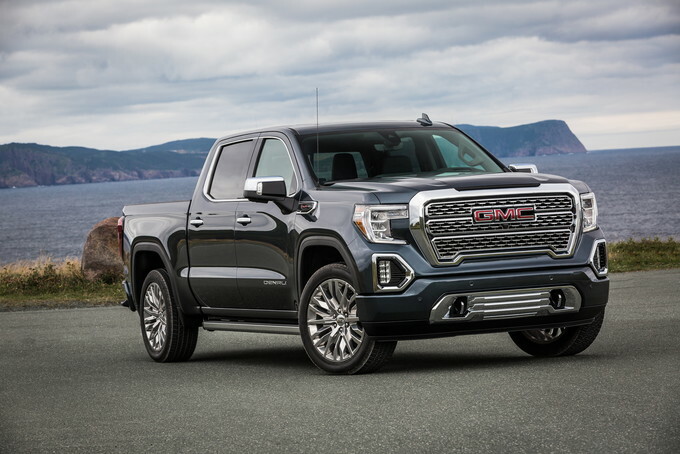 Redesigned from the ground up, the 2019 GMC Sierra continues its trend of being one of the more driver-friendly models in the truck realm. This is especially true when you move up the trim levels and hit the luxurious Denali model. But is the driver-friendly Sierra 1500 a legit contender in a segment that puts so much focus on towing and payload? Keep reading to find out. There are tons of 2019 GMC Sierra 1500 versions to choose from, and each one does its own thing well. The SLE is a mixture of daily-driver and work truck; the Elevation looks more rugged; the SLT strikes a nice balance; the AT4 gets dirty with the best; and the Denali is the Cadillac of pickups. For our money, the best value comes in the balance the SLT trim level offers. This trim has premium goodies like automatic climate control, a high-definition rearview camera, satellite radio, a 10-way power driver seat, leather upholstery, LED headlights, and a six-way tailgate. It's also the entry point into premium options like ventilated front seats, navigation, wireless phone charging, and more. The GMC Sierra 1500 has plenty of engines to choose from with lots of power. Both V8 engines pull hard off the line, but the 420-horsepower 6.2-liter V8 holds a special place in our hearts. Sure, it lacks the head-pinning performance of the F-150 Raptor, but it’s plenty for most drivers. The standard eight-speed automatic transmission paired with the 5.3-liter engine and the 10-speed that comes with the 6.2-liter engine are silky smooth. But despite all the complexities of these higher-cog-count transmissions and active fuel management, the Sierra 1500 is still a fuel hog. Models with the base 5.3-liter V8 and rear-wheel drive achieve an EPA-estimated 17 miles per gallon city, 23 mpg highway, and 19 combined. Finally, despite all its power and reduced weight in the new model year, the Sierra is upsetting in the hauling department. It can tow up to a 12,000-pound trailer and haul up to 2,240 pounds in its bed, which are 1,000 pounds and 300 pounds less than the F-150, respectively. What the Sierra offers is new technology to make towing easier, like the available Hich Guidance system and Trailer Camera Package. 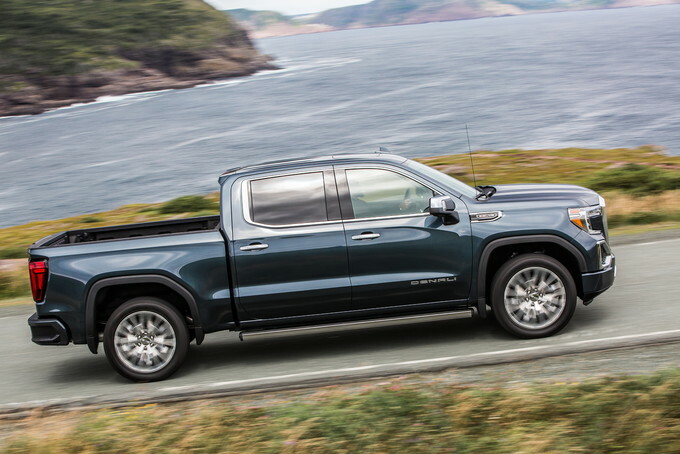 It’s a pickup truck, so there isn’t much to the 2019 Sierra 1500’s looks. Sure, it has nice touches like the C-shaped LED signature lights, a rugged grille, and some slick chrome in the Denali model, but it's still a blocky, chunky pickup. Inside, the Sierra keeps most of its pickup cues, but its higher trims gain some nice features. The Denali trim, for example, gets things like an eight-inch touchscreen, leather upholstery, open-pore wood, and dark-finish aluminum for some added class. 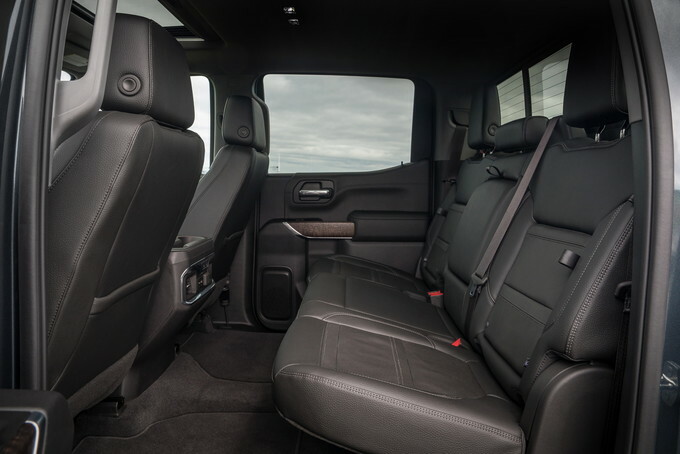 Space isn't an issue inside the 2019 Sierra 1500. It boasts 35.2 inches of rear leg room in the double cab body and a mighty 43.4 inches in the crew cab model. Got a taller family? Rear head room is also plentiful at up to 39.9 inches in the double cab model and 40.1 inches in the crew cab body. 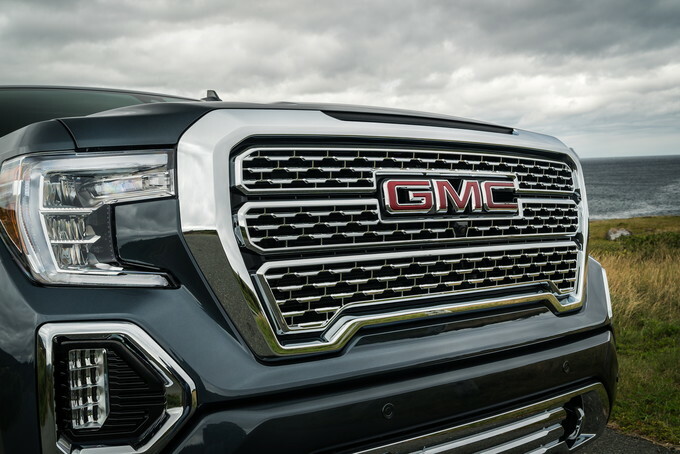 The sheer number of powertrain, body, and trim options make the 2019 GMC Sierra 1500 a great pick for virtually any truck buyer. And its Denali trim caters to the upscale buyer who needs power but wants comfort too. Falling 1,000 pounds short on towing is a big deal in a pickup truck. 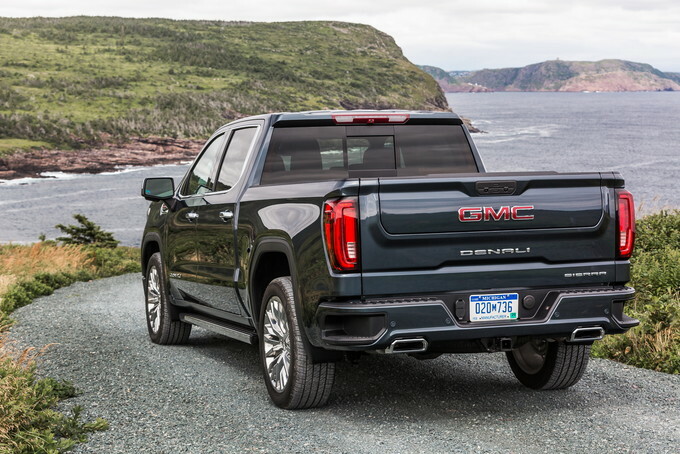 Yes, GMC pawns this off as a sacrifice for comfort and fuel economy, and it says to buy its heavy-duty trucks for serious towing, but it flies in the face of the “Professional Grade” claims GMC makes. Buyers looking for a pickup that can pull double duty as a work truck and a daily-driver will love the entire Sierra 1500 lineup. Those looking for a simple work truck will quickly learn GMC doesn’t offer a just-a-truck trim like Chevrolet, Ford, and RAM. The 2019 GMC Sierra 1500 fits a niche, and it fits it well. It caters to the slightly more discerning pickup truck buyer in virtually every trim. It makes mild sacrifices in towing and capacity, preferring to make life easier and more comfortable instead. We have partnered with trusted dealers in your area to give you a great price on the new GMC Sierra 1500.